Camping Le Val d’Ussel lies in 7 hectares of wooded parkland in Proissans in the heart of the Perigord-Noir area of the Dordogne, a short distance from the stunning medieval town of Sarlat-la-Caneda. This fantastic campsite is a firm favourite with families of all ages offering plenty of space to relax and enjoy a peaceful holiday or to take part in some of the fantastic sports and fun events that are on offer. Camping Le Val d’Ussel is also a brilliant campsite to use as a base from which you can get out and discover all the sights and wonders of the Dordogne. Although Proissans is the nearest village and is very pleasant Sarlat tends to be the place that most people head to. Being the capital of the area means that there are a number of shops, restaurants, bars and other facilities available. The town also boasts a great deal of history with buildings dating back to medieval times and some very impressive markets. The swimming pool area at Camping Le Val d’Ussel is located at the heart of the campsite, overlooking the fishing lakes. Boasting waterfalls, heated and unheated pools, a children’s pool and an inflatable pool, the swimming pool area is fantastic, offering a great place to relax and have fun. There’s also an area for sunbathing with a number of sun beds available for those who prefer to soak up the wonderful summer sun. Camping Le Val d’Ussel campsite isn’t one of the largest of campsites in the area but it still offers a fantastic range of on site activities and facilities. 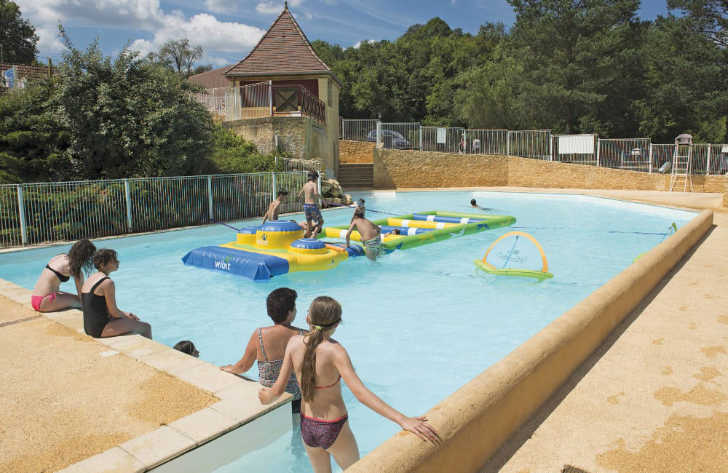 On site activities at Camping Le Val d’Ussel campsite include tennis, football, multi sports area, boules mini golf, fishing, cycle hire, sports tournaments, playground and a trampoline. Facilities available at Camping Le Val d’Ussel campsite include WIFI, restaurant, takeaway, cafe, bar, animation team, tv room , games room, washers and dryers. Accommodation at Camping Le Val d’Ussel campsite includes a range of 2 and 3 bedroom mobile homes that are available from Eurocamp and Al Fresco Holidays.